A month ago, I discussed the changes I made to my diet in 2012 that led to eating yogurt for breakfast daily instead of cereal. This was part of an ongoing effort toward eating more whole/real foods, less processed food. In that post, I discussed a lot of the symptoms I’ve had since that time. However, I’m thorough, and I knew that the change from cereal to yogurt (and other food changes made at the same time) didn’t just affect my histamine/microbiome. There was another big result that I’ve thought about a lot in the years since making the change: my carbohydrate consumption. Prior to 2012, carbs made up on average 60% (or more) of my diet. That was comfortable for my body, and I hadn’t really thought about changing it. But then at my annual exam in March 2012, my doctor (who had only seen me like twice ever) wanted to address my weight. At that time, I’d lost 75 lbs, but for months I’d been grinding out these smaller numbers, and I explained this to her. She told me that because once, years back, I’d been borderline pre-diabetic, I was probably more carb-sensitive, and I should cut my carbs back to around 40% of my diet. Because she was a doctor, I thought she must know what she’s talking about. Never mind that I was doing 5-6 hours of exercise each week, including lots of high intensity exercise. Never mind that I’d lost a lot of weight already. Never mind that my blood work showed no signs of insulin resistance. Never mind that she tried to sell me weight loss shakes and bars while giving me this advice. This doctor didn’t know me, and from later interactions with her, I discovered that she didn’t really listen to me, either. She believed that I was exaggerating my exercise habits and weight loss, and that I was either lying or ignorant about my eating habits. She didn’t give me enough credit, and I didn’t give myself enough credit. I simply followed her advice, blindly, because it dovetailed so nicely with all the food trends that were exploding onto the scene everywhere, and didn’t that mean it must be right? My doctor didn’t expect my discipline and tenacity. I cut my carbs back ruthlessly to 40% of my diet that March. 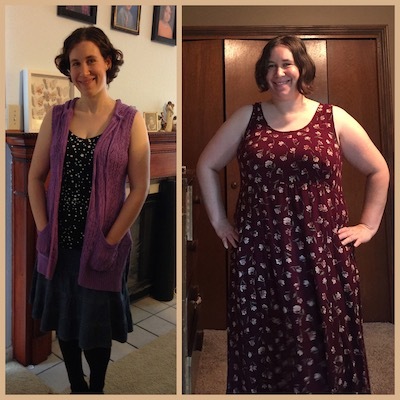 My body dropped about 3 lbs, and I was ecstatic – it was working! Only then, it just stopped working, and I had my first sign that something was wrong – a menstrual cycle that lasted only 12 days. It was a fluke, I reasoned, and didn’t connect it to the change in my diet. The following month, I did my week-of-whole-foods experiment (when I switched to eating yogurt), and that cut my carbs further, to around 35%. Again, I lost about 3 lbs, only to gain them back immediately the first time I consumed a minuscule amount of “off-plan” food. Once again, evidence was staring me in the face that this kind of eating was not sustainable or healthy for me, but I ignored it and stubbornly stuck to what I believed I was supposed to do. For the next seven years. The only time in the last seven years that I haven’t been eating around 35% carbs was when I did Whole30 in the fall of 2014, when that percentage dropped to around 25%. And hey, that dropped me a whole 12 lbs! Never mind that after I was done, I couldn’t stop regaining weight until I’d regained 80 lbs. What a tradeoff. Again, I’ve thought a lot about this change in diet since making it seven years ago. I’ve often wondered if the choice was a mistake, and if I should increase my carbs. Fear kept me compliant. While my blood work looked excellent seven years ago, I’m now on the higher end of normal in terms of glucose and A1C measurements – seriously, eating fewer carbs made me more insulin resistant – and I worried about insulin resistance getting worse if I ate more carbs. Additionally, I abandoned my few attempts to experiment with higher carbs because each time I’d start gaining weight. Clearly, it wasn’t working, right? Except…here’s a key piece of chemistry that I didn’t know until recently: When you decrease carbs, you’re going to immediately lose a flush of weight, but it’s not fat. It’s a combination of water and glycogen, the latter being key. Your muscles store glycogen for ready energy usage, and it’s the first thing to go when you decrease carbs. And as one might expect, you’ll replenish glycogen stores when you increase carbs, which will cause a bump on the scale even though your size doesn’t change even the tiniest bit! And glycogen? That stuff is important. A month ago, I took a deep breath and increased my carbs to over 50% again. I expected weight gain and problems with hypoglycemia due to insulin spikes/drops. Weight gain: three pounds, no change in inches. Hypoglycemia: None whatsoever – in fact, my blood sugar has been more stable. Beyond that, I had a lot of positive results from the increase, as well as a couple mixed results. Notably, I’ve had absolutely no negative changes from the new diet. My hormone profile completely changed, most notably affecting my facial skin. On the good side, I lost all the rash and redness related to inflammation and my skin began to look healthy again. On the negative side, the healthy skin came as a result of increased oil production, so I’ve dealt with a lot more acne. This seems to be leveling out after a few weeks, however. My depression was both positively and negatively affected. Carbs are needed for serotonin production in your body. Makes sense, then, that I would develop depression mere months after I cut back on carbs in 2012! On increasing them, I immediately had a mental health boost. Yay! However, the depression returned quickly, for three reasons: hive-related inflammation (inflammation also causes depression), antihistamine side effects (Xyzal is the worst! ), and an increase in my sugar consumption (another cause of depression). This balance – increasing carbs without increasing sugar – is one I’m learning, and I’m working on the inflammation/histamine issues. My hope is that this will eventually be a 100% positive change. I no longer get bone/organ/joint pain after high intensity exercise or strength training. Just a little muscle soreness as you’d expect. Clearly my body requires glycogen for these things!! I also no longer experience ravenous hunger after moderate to heavy exercise. Before, if I did any exercise more taxing than a walk on hills, or any kind of strength training besides yoga, I’d experience this gnawing, insatiable hunger for about 24 hours (or longer if I didn’t give in and eat more than normal). This no longer happens. I can exercise at any intensity and my hunger levels correspond appropriately. I had increased energy and less fatigue. This was later countered by hive attacks, but I’m sure the energy will return once I can figure out the underlying medical issues and get rid of the massive inflammation my body is currently dealing with. My body temperature stabilized, no longer swinging wildly from being very hot to freezing cold. I didn’t even know that was related. I stopped peeing 30+ times a day (that’s not an exaggeration). I thought I just had an overactive bladder, but it turns out that my body wasn’t getting properly hydrated when I wasn’t eating enough carbs. Considering that my post-Whole30 attempts to eat paleo always fell apart within days due to extreme thirst that could only be satisfied by eating rice or beans, this shouldn’t have surprised me as much as it did! Better sleep! The insomnia hasn’t gone away completely, but most days I sleep deeper and more restfully, even on days when I don’t get enough sleep. I had none of my normal menstrual-cycle related symptoms during my last cycle: no bloating, increased hunger, weird cravings, drops in blood pressure, weight gain, or digestive system problems. It was the first normal cycle I’ve had since that “fluke” in 2012. My body reacts differently to alcohol. I still get a bump on the scale after drinking it, but it drops after a day or two rather than my body holding onto the weight for weeks. I also don’t get insane carb cravings when I drink alcohol. While I’m not 100% there yet, I’m starting to realize that I can trust my intuitive eating cues and physical hunger symptoms again. This was something I’d lost and thought the loss was related to emotional/stress eating, but even once I got back onto a relatively level emotional field, I couldn’t rely on hunger cues. I’m starting to be able to tune into them again. Here’s the thing: long-term effects for low-ish carb diets haven’t been studied, especially in women. No one expects you to stick to this way of eating for seven years straight, and of course every body is different and reacts differently. Clearly low-carb (even low-ish carb) doesn’t work for me, despite what I’ve thought and said and done for seven years. So I’m making these adjustments, relearning how to eat, and figuring out where to go and what to do next. I really do hope that after my doctor can address the root cause of hives/inflammation, I’ll be in a good place to address the rest of my health, since I seem to have removed a major factor in the troubles I’ve had for years now! 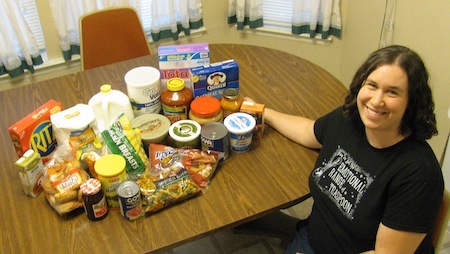 This entry was posted in Wellness and tagged food, health, Wellness Wednesday. Bookmark the permalink.